In this fast-moving world, we are surrounded by a stress filled life. The kidney is an important organ of our body and in order to detoxify the body, it removes excess water from the body and also the waste products, so that we can live a uniform life. So, if the kidney won’t work properly, then we may suffer from some serious issues like stomach pain, water retention, exhaustion, headache and many more. If we talk about kidney stones, then it is the most serious problem which adults, as well as children, face these days. So, we need to take care of this organ to have a better life. Here are few ways to cure your kidneys; you just need to apply it. Drink water as much as you can: This is one of the best effective ways to detox your kidneys. Your water intake helps your kidneys in functioning better. Try to drink 8-10 glass of water per day as it will help to filter your accumulated toxins. If you drink water much, then you will have clear urine which is a good symptom of clean filtering system. Try to eradicate fluids like aerated drinks, coffees and colas. Start drinking Lemon Water: Start your morning with a glass of lemon water, as lemon has a variety of benefits. Lemon filters your blood and also prevents calcium in binding with other minerals which result in stones. Try to ditch salt: Sodium can have a negative impact on your kidney and can increase the risk of stones. Eliminate the use of salt for the sake of your kidneys as well as your life. Eat fruits: Green vegetables and fruits have the potential to cleanse the kidneys. Citrus fruits like sweet lime, bananas, kiwis, prunes, oranges, apricots, grapes and cantaloupes are a better cure for kidneys as they have a rich source of potassium. Include these rich potassium foods in your diet to maintain a good level of electrolytes. Yogurt and milk are good for kidneys so eat them too. Work for sweat: Yoga, Zumba, swimming, running, and gym are a good way of exercise, and are vital to your overall health. They not only keep your kidneys healthy but also help in keeping your heart fit and strong. Eat berries: Don’t forget to eat berries as they help in cleansing your kidneys. They are rich in powerful antioxidants which prevent kidney stones. Berries are of different types like blueberries, blackberries, strawberries, and raspberries, all of which are healthy for your body. They are good in taste, so if you are a fruit lover then eating berries will be helpful in the overall development of your body. Drink juices: Juices are available in various varieties and are beneficial for our kidneys. You can drink juices like orange, watermelon, apple, beetroot and much more; all will boost your stamina as well as will provide nutrition to your kidneys. Quit Smoking: Quit your smoking habit if you are a smoker as it damages your blood vessels and decreases the blood flow to your kidneys. Smoking makes it difficult for your body to function properly. It also results in increasing your blood pressure. So, quit it before it’s too late. Stay away from alcohol, caffeine and chocolate: In a research, it was found that, these elements are bad for your kidney and after using them you can suffer from an overall body reaction due to which doctors prescribe not to eat/drink them. Herbs: A variety of herbs and spices can keep your kidneys healthy. Herbs such as ginger, turmeric, and parsley help in treating kidney stones and relieve your body from painful urine infections. Add all of them to your eating habit and heal your kidneys. 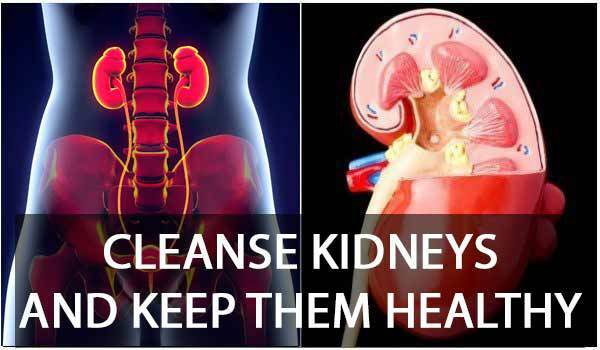 Following these simple tips can help you in detoxifying your kidneys without many efforts.